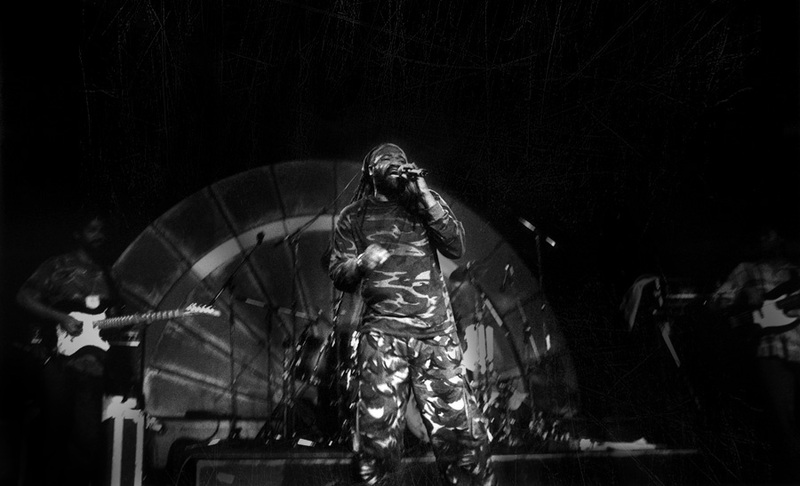 Photo Tony Rebel black and white photo shot by Floyd Celluloyd for Innermann a decade of reggae photography. Please respect the copyright. Do not use the photos without written permission. Tony Rebel, born Patrick George Anthony Barrett, 15 January 1962, Manchester Parish, is a Jamaican reggae deejay. He was initially a singer, appearing as Papa Tony or Tony Ranking in local talent contests and on sound systems including Sugar Minott's "Youth Promotion". His first release was the single "Casino" that appeared in 1988 on the MGB record label, although his career took off when he worked with Donovan Germain's Penthouse setup in the early 1990s. He had a big hit in 1990 with "Fresh Vegetable", and established a singjay style of delivery. He is notable as one of the few dreadlocked "cultural" deejays of the ragga era. In 1992 he signed a deal with Columbia Records who released Vibes of the Times the following year. In 1994 he founded his record label, "Flames". Tony Rebel is famous for his "Rebel Salute", the annual tribute to his friend, the late Garnett Silk, each January in St. Elizabeth (originally it was held in Mandeville, Manchester). Roots and Culture have been his "stock-in-trade" since the days when he linked with Silk on the Destiny OuterNational Sound System in Manchester. Combining, as well, with other performers like Everton Blender, Uton Green and Culture Knox, Rebel would use this foundation to help forge a positive vibe that went a long way toward saving the Dancehall scene from imploding right through the 90s and into the 21st century.